Golden Moles come from South Africa and look quite a lot like good, old fashioned, normal moles, but they actually aren't closely related at all. Their front paws have one great, big claw, one normal one and that's about it. The other three fingers are tiny and useless, and one of them is gone entirely. The hind paws have a full assortment of digits and are webbed to push the earth away. Some make molehills with this refuse, others just push it into the sides of their tunnels. They have tough skin and an even tougher nose to protect their nostrils, while their dense fur keeps the dirt at bay. With smell and touch, they find the insects that make up their din-dins. 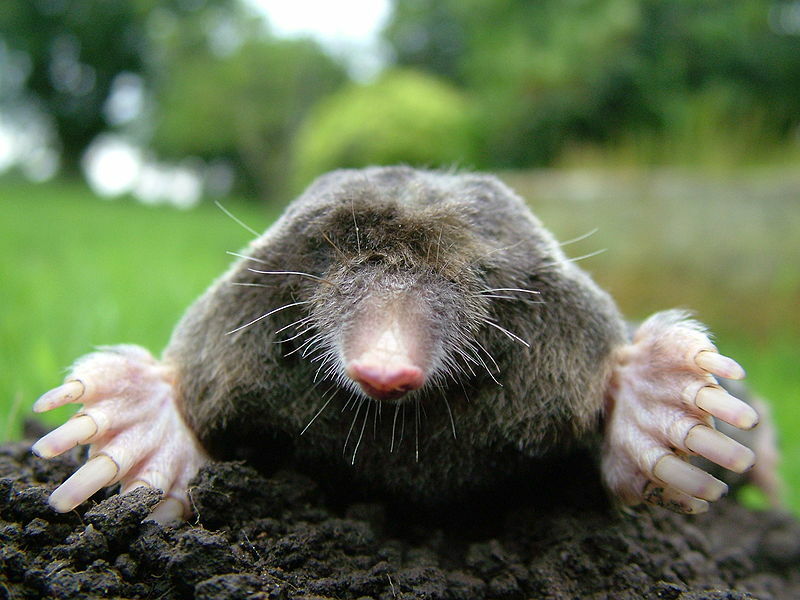 Do you remember the Golden Mole? What!? They were the ones that came from South Africa and looked quite a lot like good, old fashioned, normal moles, but they actually aren't closely related at all. Anyway, the Marsupial one is even MORE similar to the Golden one than the Golden one is to the normal ones. But, being marsupial, this mole isn't closely related to either one. And, of course, they come from Australia, specifically the desert parts in the west. 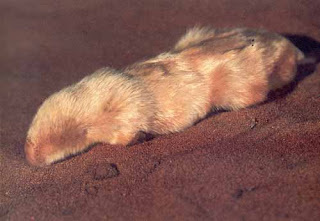 Since we're talking about sand, the Marsupial Mole doesn't so much dig as swim through the desert, allowing tunnels to collapse behind them as they seek out beetle larvae and caterpillars. They have two big claws on their front feet, dense fur and a tough nose to protect their nostrils. The vertebrae of their neck are also fused together, which seems pretty drastic. Then again it's pretty clear that they've made their bed, so I guess they may as well dig through it. 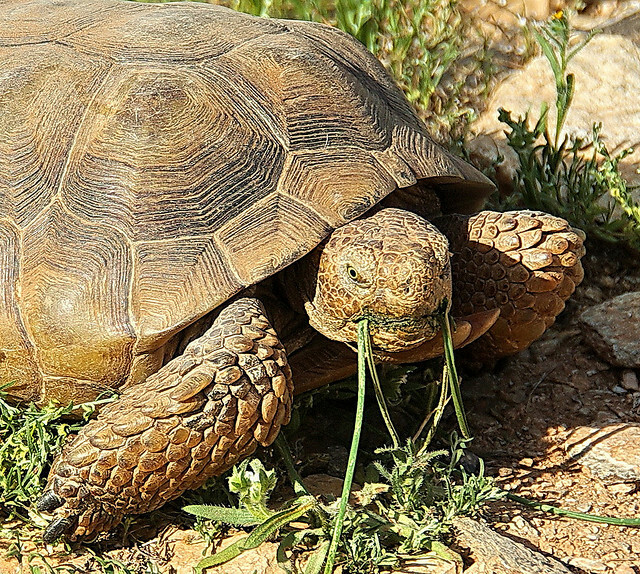 The Desert Tortoise lives in the desert! Specifically the baking heat of the Mojave and the Sonoran in Southwestern U.S. and northern Mexico. They reach about a foot in length and have strong, muscular front legs with big claws, big scales and a flattened shape for digging. They spend some 95% of their life in burrows, be they little ones for some quick shade from the sun or palatial ones that can extend for several feet. 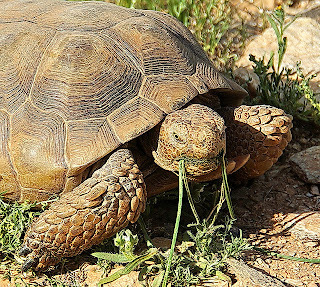 They can go without water for a whole year, helped in no small part by the fact that their bladder can store 40% of the tortoise's entire body weight in water. I wish I could do that. I mean, 40% would be a bit much, but the option would be nice. The Mexican Burrowing Toad is from Mexico! Also southern Texas and the east and west coasts of Central America. Also it's a frog, not a toad. Still, they got the "burrowing" part exactly right. 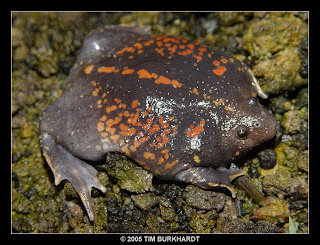 The "Mexican" Burrowing "Toad" spends much of it's life digging through the ground with it's short, powerful legs, aided by tough appendages on its feet. It eats primarily ants and termites. Perhaps it just likes the taste, or perhaps a nice, juicy colony of endless insects is something to stick around for. These frogs constantly lie in wait of unpredictable heavy rains, when they can surface to mate and lay eggs in water. They might travel a mile to find an appropriate place for their tadpoles, who will emerge as adults after 1 to 3 months. Jawfishes live in coral reefs around the world, where the sun is hot and the sand is soft. They need soft sand because they will take a big mouthful of the stuff and then spit it out. It's not boredom, it's how Jawfish create their burrows. 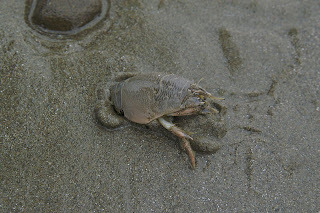 Mouthful by mouthful, they shift sand, small stones and shells to create a safe abode to call their own. Oh, and everything that surrounds it, that's his too. Jawfish are territorial and they will defend their turf with all the imperious indignation they can muster. Head held high, Lord Jaw Aurifrons Fish IV, Earl of Burrow-under-Sea surveys his domain. That isn't the only thing those jaws are used for, aside from plucking tiny plankton to eat, males also hold the eggs in their mouth to protect them until they hatch. Maybe he's not such a mean, old Mr. Fish after all? Mole Crickets exist on every continent but are nocturnal and live almost entirely underground, such that they aren't often seen. They're quite unmistakable, reaching some 5 centimetres (2 inches) in length and armed with gigantic front legs for carving their subterranean path. They are omnivorous, eating worms, larva and roots. They still chirp even though they are under the earth. To amplify the sound, they construct a double horn structure in their burrow (here's a single horn). Despite all that, mole crickets can still fly. In fact, the desire to mate can inspire them to travel up to 5 miles in search of... er, a double horn, I suppose. wow...is it me or does digging seem like a fad for all different kingdoms of animals? I don't think it's just you! Burrowing seems to be a popular lifestyle all over the place. I guess it stands to reason, what with the ground following us almost everywhere we go! I really enjoyed taking a look at all the different burrowing creatures. I felt like I had a special treat seeing more than one animal today. i get claustrophobic just thinking about the life of a mole - no light, no AIR, just DIRT! UGH!!! Practically hyperventilating just thinking about it!!! Can you imagine sitting underground for 17 years, nibbling on sap? I feel like I'd get bored of that after 10 minutes. I'd literally go insane after a few weeks. Yet those little buggers do it for 17 years. Every one of them. 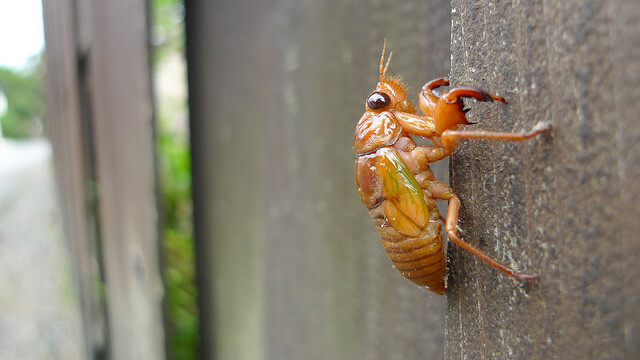 Remind me never to mess with a cicada. @Emma: I'm glad you liked it! @texwisgirl: I know! It's quite amazing the kinds of lives different animals can lead. Definitely not for me, though! @Crunchy: 17 years... it really is an extraordinary amount of time. When I think of all the things I'd done by the time I was 17 and compare it with cicada... madness!